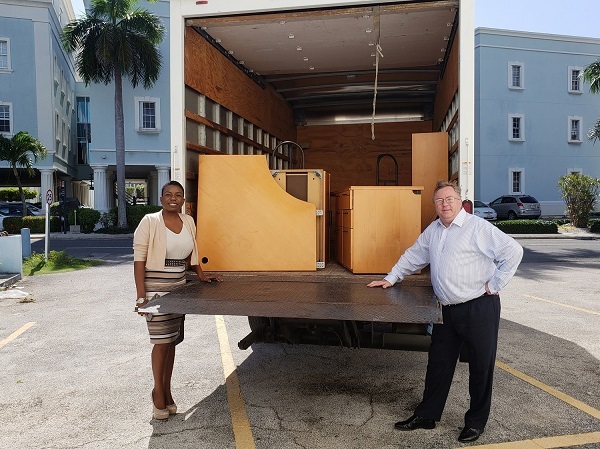 Several charities in the Cayman Islands have received secondhand office furniture provided by local law firm HSM. The Family Resource Centre recently moved to a new location in George Town and were thrilled to receive a full desk set complete with joining desks, a filing cabinet and bookshelf. One Dog at a Time collected two large filing cabinets, which volunteer Paula Wythe says is ideal for storing away pet products such as shampoos, brushes, medications and more. The Frances Bodden Children’s Home selected a large desk for their facility in West Bay. This is not the first time HSM has donated office furniture. A few years ago, HSM donated desks to Her Majesty’s Northward Prison for their F-wing, an enhanced living space for selected inmates. “We are always looking for opportunities to support our community and what better way to start the New Year than helping these charities improve their daily operations,” shares HSM Managing Partner, Huw Moses OBE. HSM still has desks, cabinets, keyboards, blinds and commercial UPS switches available to a worthy home. Email Alyson Hay at ahay@hsmoffice.com to register your charity for these items. Photo R-L: Huw Moses (HSM Managing Partner) overseas the departure of this furniture set to Racquel Duhaney (Programme Facilitator at the Family Resource Centre).